Time is a vital resource for managers. Time is the one commodity that cannot be stored or saved for a rainy day. Managers must learn how to control both their time and the time of their direct reports in order to be most effective and productive. This module will help teach your managers to develop to-do lists, prioritize activities, control telephone time, reduce disruptions, save time, and manage their time effectively and efficiently. In order to achieve corporate objectives, managers must first set goals and standards and achieve buy-in from their direct reports. This module will help teach your managers critical goal setting skills including how to build buy-in for goals, how to develop standards, overcome resistance, and prioritize goals. Managers spend most of their time juggling a variety of activities but effective managers know that in order to maximize performance, they need to plan and schedule work accordingly. These skills allow managers to be proactive in achieving their goals on a timely basis. 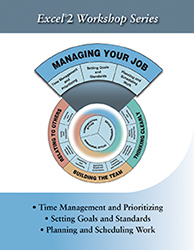 This module teaches effective planning and organizing for teams and individuals, basic planning techniques like analyzing work-flow, and preparing Gantt and PERT charts.